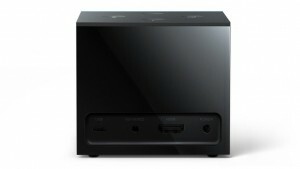 This post provides an in-depth Fire TV Cube Review and has been written to help you determine whether you will purchase one or not. Last year, the Fire TV 3 was released which has been considered an “in-between” of the 2nd Generation Fire TV and 2nd Generation Fire TV Stick. The Fire TV 3 didn’t receive as much praise as the 2nd Generation Fire TV due to a few reasons. The 2nd Generation Fire TV is faster due to a more powerful processor and has more features than the Fire TV 3. 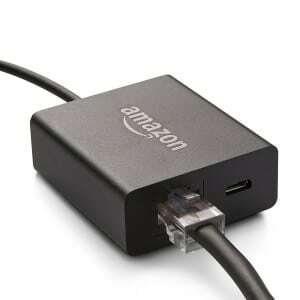 The Fire TV 3 did not include an Ethernet adapter or expansion ports such as USB or SD/Micro SD. You can purchase an OTG cable that allows you to connect those types of peripherals but you probably won’t see a speed gain with an external Ethernet adapter. The only big selling point of the Fire TV 3 was the fact that it supported 4K HDR which the 2nd Generation box lacked. If you don’t have a 4K HDR television, this is a moot point and obviously no reason to “upgrade”. You can find a chart below where I compare the Fire TV Cube, Fire TV 3, and 2nd Generation Fire TV Stick. 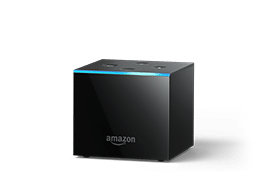 The Fire TV Cube is a nice upgrade if you are interested in Alexa voice control and the ability to expand your internal storage. Personally, voice-control has never been a huge selling-point for me. I would have rather seen Amazon improve the Fire TV Cube with additional processing power, making it comparable to the NVIDIA SHIELD. Can’t voice-control apps that are side-loaded such as Kodi, Terrarium TV, Morpheus, etc. My Fire TV Cube review will take you through the step-by-step testing process that I went through when I first received this device on June 21st, 2018. After unboxing the Fire TV Cube, I was surprised to see that the package did not come with an HDMI cable. 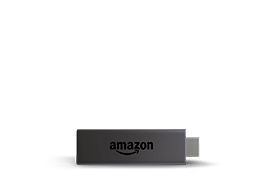 All Amazon Fire TV devices in the past have had everything included that would allow for the end-user to start using it immediately. After paying $119.99, I would expect that they would have at least thrown in a 6-foot HDMI cable. The following items were found within the box; Fire TV Cube, Alexa Voice Remote, power adapter, quick start guide, marketing guide, 2 AAA batteries, Infrared (IR) Extender Cable, and Amazon Ethernet Adapter (10/100). It is important to note that you must purchase an OTG cable if you would like to connect USB peripherals such as USB drive, keyboard, etc. There is a micro usb port embedded into the Ethernet Adapter but this is only meant for providing power on the Fire TV 3 and 2nd Generation Fire TV Stick. Yes, it is the same Ethernet adapter that you can purchase for $14.99 on Amazon. As with all Amazon products, the contents of the box seem to be of high quality and the Fire TV Cube looks very attractive. I hooked the unit up to my Toshiba HDTV in my office and powered it on. Amazon does a great job taking the user through the setup process as usual. During the initial setup, it successfully connected via infrared and HDMI-CEC to my television which will allow me to control that with my voice. I don’t have cable, satellite box, or soundbar in my office but the Fire TV Cube will also be able to control those devices as well via voice commands. I now have the ability to adjust volume, channels, and playback on my television by simply issuing commands to the built-in Alexa feature. As I mention in my first impressions, the voice-control feature is not a big deal for me, but it may be for many users. During the setup process, the device did connect to the Internet and perform a mandatory update which was nice to see. Obviously, Amazon has already rolled out some necessary bug fixes for the Fire TV Cube. After getting everything setup, I did test how the voice commands worked in conjunction with my television. I tested the following commands. Each command that I sent via voice worked flawlessly on the Fire TV Cube. Again, the voice commands can also be used on other devices such as cable/satellite boxes, soundbars, etc. Next, I plugged in an OTG adapter because I wanted to see how well USB storage would work on the new Fire TV Cube. External storage has been a big problem with the 2nd Generation Fire TV Stick and Fire TV 3. I plugged in a 32 GB USB drive that I formatted as FAT32 file system and the FireCube recognized it immediately. Once I went into Settings, I was happy to see that we can now expand the current internal storage with the USB drive. I also noticed that the USB drive shows up as a storage option within apps such as Kodi, even when it hasn’t been added to the internal storage. Amazon has been listening to the complaints! Next, I wanted to see if we could still side-load apps like we have with all other versions of the Fire TV. I installed the free Downloader application through Amazon App store and then proceeded to install Kodi on the Fire TV Cube without any problems at all. 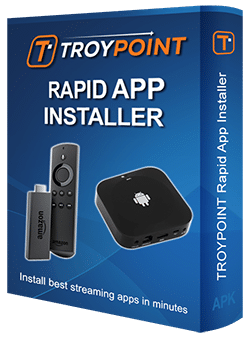 I then installed the TROYPOINT Rapid App Installer so that I could quickly side-load all of my other favorite apps such as Eternal TV, Area 51, Terrarium TV, Popcorn Time, Morpheus, IPVanish VPN, and a few others. All of my favorite apps that I use on a regular basis with my other streaming devices worked great on the new Fire TV Cube. After I tested the side-loaded apps, I wanted to see if the Alexa voice commands would work for those as well. I used Kodi and Terrarium TV as a test. “Alexa, open Kodi”, it didn’t work. “Alexa, open Terrarium TV”, that didn’t work either. I then tried Downloader. “Alexa, open Dowloader”, that one worked. Remember, this is an app that I installed directly through Amazon App store. It appears that you can’t open and close Fire TV Cube apps unless they are acquired through the official Amazon Fire TV App store. 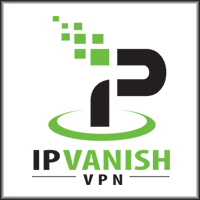 Now it is time to test Internet download speed on the Fire TV Cube with our favorite VPN, IPVanish on and off. I tested the Internet download/upload speeds with the Speedtest.net application on my 150 Mbps cable Internet connection. Note: The Ethernet adapter for the Amazon Fire TV Cube is capable of speeds up to 100 Mbps whereas the wireless adapter can achieve higher than that. This is the reason why the wireless connection performs faster than wired on this device. 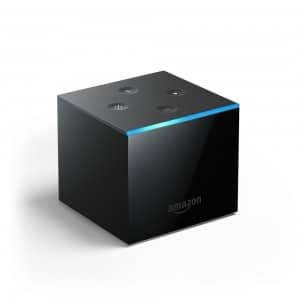 I feel that the new Amazon Fire TV Cube is a great choice for those who are interested in Alexa voice control and a better storage system. The Fire TV Cube now lets us expand internal storage and also use external storage independently as well if we would like. This is the main feature lacking in the Fire TV 3 and 2nd Generation Fire TV Stick. The 2nd Generation Fire TV worked great with External storage and it is nice to see this area improved. Speaking of the Amazon 2nd Generation Fire TV, this will be back in stock as a refurbished item starting on July 1st. 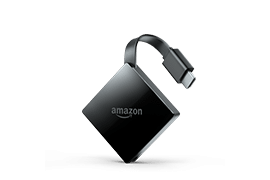 The 2nd Generation Fire TV is still one of my favorite streaming devices and it comes equipped with a more powerful processor than the Fire TV 3 and Fire TV Cube. In closing, I wish Amazon would have improved the processing power within this device as opposed of focusing so much on the Alexa features. It would be nice to find a device similar in specs to the NVIDIA SHIELD for a smaller investment. I am aware that there are many cord-cutters who also enjoy Alexa and this will be a match made in heaven for them. Fire TV Cube is a hands-free streaming device with Alexa, delivering an all-in-one entertainment experience. From across the room, just ask Alexa to turn on the TV, dim the lights, and play what you want to watch. External storage is now recognized by the Fire TV OS and can also be used to expand internal hard disk. With far-field voice recognition, eight microphones, and beam-forming technology, Amazon Fire TV Cube hears you from any direction. Enjoy hands-free voice control—search, play, pause, fast forward, and more. Plus, control your TV, sound bar, cable or satellite box, receiver, and more with just your voice. Access Facebook, YouTube, Reddit, and more websites with Firefox and Silk web browsers. An Amazon Prime Membership unlocks thousands of movies and TV shows. Enjoy unlimited access to millions of songs with Amazon Music, starting at $3.99 per month. Install Kodi for Fire TV Cube and enjoy free movies, TV shows, sports, and live TV. Sideload apps onto the Fire TV Cube such as Kodi, Terrarium TV, Morpheus, IPTV, and more. Setup VPN for Fire TV Cube and protect your identity with encrypted connection to the Internet. Voice control compatibility: Fire TV Cube can control a wide range of IR-enabled devices, including TVs, soundbars, cable and satellite boxes, and A/V receivers. Learn more about supported devices. System requirements: High-definition television with available high speed HDMI input, high speed internet connection via Wi-Fi or inbox Ethernet accessory, power outlet, (compatible TV/sound/cable equipment for control by infrared or voice). High Speed HDMI cable and 4K TV with high speed HDMI connector required for 4K viewing and more reliable device control. TV compatibility: TV must support minimum HDCP requirements for protected content playback. Learn more. Able to control (1) 4K ultra high-definition TVs with HDMI capable of 2160p at 24/25/30/50/60 Hz and HDCP 2.2, including popular models from LG, Samsung, Sony, Sharp, Toshiba, Vizio, and others or (2) high-definition TVs with HDMI capable of 1080p or 720p at 50/60 Hz, including popular HDCP-compatible models from Hitachi, JVC, LG, Mitsubishi, NEC, Panasonic, Philips, Pioneer, Samsung, Sharp, Sony, Toshiba, Vizio, Westinghouse, and others. (For device control, certain functions may not be available on some devices). Warranty and service: 1-Year Limited Warranty and service included. Optional 2-Year and 3-Year Extended Warranty available for U.S. customers sold separately. Use of Fire TV is subject to the terms found here. Accessibility features: VoiceView screen reader enables access to the vast majority of Fire TV features for users who are blind or visually impaired. Watch videos and TV shows with closed captioning displayed. Captions are not available for all content. Learn more. 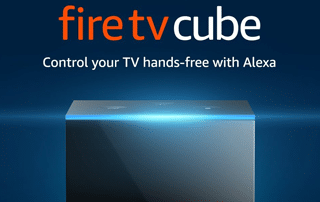 Tell us in the comments if you will be ordering the Amazon Fire TV Cube and why or why not? Hi Terence, yes I don’t know why it wouldn’t. Troypoint I just replaced my fire stick with fire tv cube. I downloaded ipvanish & then kodi 18.1 successfully. I have tried several times to download the supercharge but am unable to. Any suggestions??? Carolina, you are already a subscriber. You can’t register more than once. Please refer to the Newsletter that was sent yesterday. Each weekly Newsletter includes these subscriber-only links at the bottom. I think I worded my question incorrectly, I have the guide – but the add on in the supercharge guide won’t download. I thought it was because I didn’t set up my ipvanish first, but I went back after setting up ipvanish and it still won’t download? Hi Carolina, when the addon doesn’t install, this is usually due to making a mistake while typing in the address. Please go through video again and click Pause button on video player between each step. That seems pretty slow 15 -19 mbps on IPvanish, is that fast enough for 1080p streaming? Hi Steve, yes 1080p should only require 10Mbps and possibly lower. Mine buffers like crazy. It’s been so bad, we can’t even watch anything on it more than half the time.